don't get caught: Develop a strong social media voice with "@NoReservations"
Develop a strong social media voice with "@NoReservations"
Anthony Bourdain's been in my face lately, particularly on social networks. And that's probably just where he wants to be, given the celebrity chef's strong so-what, try-anything way of operating. He reminds me why it's so important for you to develop and maintain a strong, recognizable voice on social media networks--whether you're a brand or an individual. I wasn't prepared for exactly how goddamn brilliant the thing was, or how enchanted, difficult, strange, rich, inspiring and just plain hard her life and career--her long road to Prune--had been. I was unprepared for page after page of such sharp, carefully-crafted, ballistically-precise sentences. I was, frankly, devastated. I put this amazing memoir down and wanted to crawl under the bed, retroactively withdraw every book, every page I'd ever written. And burn them. That's grab-by-the-throat writng. and much more content and flavor than we get in most blog posts and status updates. It's memorable, and that works for the brand. Kindle and the publisher may figure you don't know the author, but you're likely to know Bourdain--and he's not easily impressed. I'll bet this endorsement sold more than a few books and e-books. 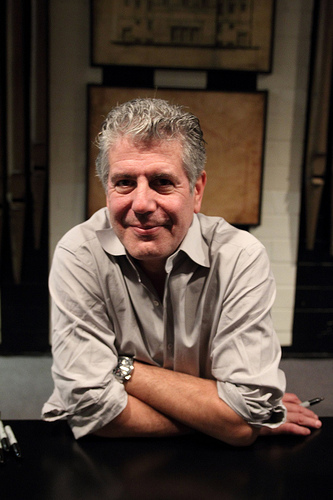 And so was this experiment, in which Bourdain himself live-tweeted the premiere of his show on the Travel Channel, No Reservations, using the show's Twitter account @NoReservations. 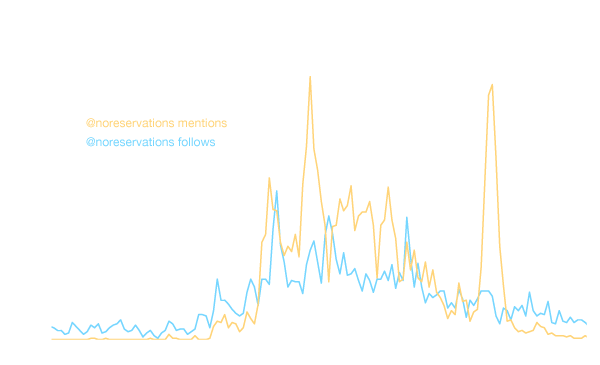 The Twitter Media blog (Twitter's effort to show what news and entertainment journos are doing with Twitter) took this look at live-tweeting with No Reservations. 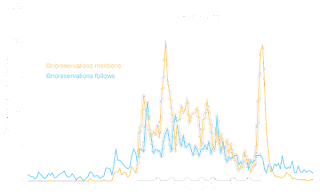 More and more television shows are tapping into viewers who are also using Twitter and Facebook during important shows or episodes. On the vertical axis you can see both follows and mentions per minute. When the episode begins, and Anthony Bourdain starts tweeting, both metrics leap as if electrified. All told, Bourdain gained about 10,000 new followers on Monday—more than 3,000 of those during the hour-long premiere itself. What did the trick? I'm guessing it was in part due to live, real-time access to Bourdain, but mostly due to his salty and sly commentary: behind-the-scenes tidbits (like who was drunk and how drunk they were) and his usual don't-hold-back attitude. Something might happen any second when he's live-tweeting, which makes the curious want to watch...and follow. Followers expand the brand's reach the next time it wants to reach and engage viewers. 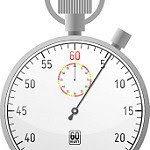 Developing a strong voice takes time, but pays off. Your readers will come to know what to expect from you, and you'll be giving them more to which they can respond, compared to bland "safe" postings. Think about delineating your specific focus for posts. What will you post about? What will you not post about? What will the exceptions be? Why? What's your specific angle? What void are you filling? Whom are you speaking to? What are you trying to accomplish? Who cares? Who doesn't? What do you care about? What makes you laugh? What gets you angry? What's frustrating in your work? What can you support wholeheartedly? What would you decry? Then start planning and inserting those views into your Twitter or Facebook posts, your Quora discussions, your online videos and more. You can see from the questions that I think you need to have an opinion, or several. (I like to say that if you don't have a personality in social media, you need to go get one.) Your point of view helps make your posts unique in a sea of social networking. Playing it safe removes you from risk and the fray, but also removes you from connecting with us, which means we can't always grasp who you are and what you're doing here. Try posting with no, or at least fewer, reservations and see how your voice develops.